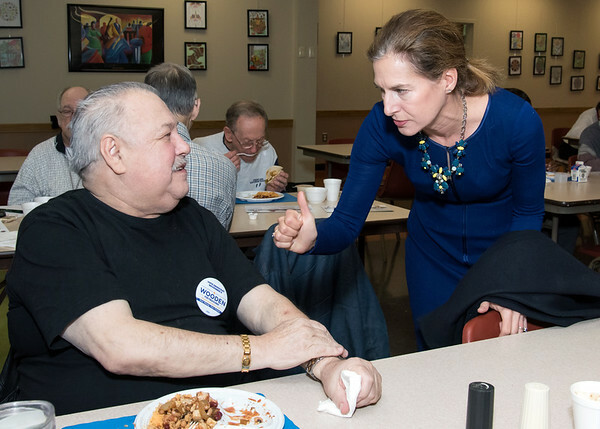 NEW BRITAIN - With one week to go before voters take to the ballot boxes, lieutenant governor candidate Susan Bysiewicz and others on the state’s Democratic ticket visited the city Tuesday. 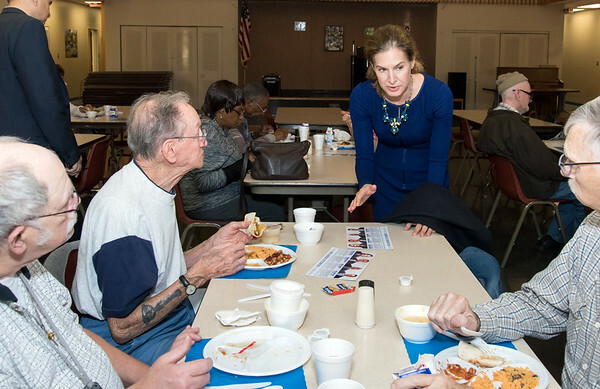 Bysiewicz, treasurer candidate Shawn Wooden, Secretary of the State Denise Merrill and state Sen. Terry Gerratana, D-New Britain, visited the New Britain Senior Center. “They were just telling us how much they love the Senior Center and how important it is in the city,” Merrill said after a conversation with resident Shirley Hiser. Bysiewicz said she and her running mate, Democratic gubernatorial candidate Ned Lamont, have been crisscrossing the state as Election Day nears. “We’ve been visiting six to 10 towns a day,” Bysiewicz told The Herald. She said the Democratic slate has made significant “get out the vote” efforts over the past few weeks. Bysiewicz said there is lot of excitement surrounding Connecticut Democrats right now, notably around U.S. 5th Congressional District candidate Jahana Hayes. Wooden shared the sentiment that voters seem increasingly engaged in this year’s election. “For the past couple of months traveling the state, the energy and enthusiasm everywhere is surprising, even in places that aren’t filled with Democrats,” Wooden said. Quinnipiac University released a new poll Tuesday on the gubernatorial race, calling it “too close to call.” In the poll, Lamont was favored by 47 percent of respondents, Republican Bob Stefanowski by 43 percent and unaffiliated candidate Oz Griebel by 7 percent. The poll surveyed 1,201 likely voters and has a margin of error of 4 percent. Bysiewicz told The Herald she thinks her ticket is faring a little better than the poll suggests. The candidate said she’s heard reports of record numbers of absentee ballots this year, and young voters seem to be engaged. “We feel like we’re doing well, but we’re not taking anything for granted,” Bysiewicz said. “The polls are only a snapshot. New Britain has been a popular spot for candidates to visit. On Monday, Griebel and his running mate, Monte Frank, spoke to workers at Stanley Black & Decker’s corporate office. On Saturday, Stefanowski will visit Little Poland. Posted in New Britain Herald, New Britain, State on Tuesday, 30 October 2018 21:03. Updated: Tuesday, 30 October 2018 21:05.